Paint Protection provides a “peace of mind” protecting your vehicle. One Stop Detail Shop has been protecting vehicles in Edmonton for over 10 years. One Stop Detail Shop commitment to protecting your vehicle is absolute. Each of our unique protection services are guaranteed to help you protect and extend the life of your vehicle. 1. Keeps your car looking brand new longer. 2. Reduces the chances of superficial damage on your car’s paint. 4. Paint Protection reduces the need for polishing. 5. Increases your car’s resale value. Your vehicle is constantly exposed to dirt, moisture, liquid spills, food remnants and people. It’s not about how careful or clean you are. Spills and stains are a part of everyday life. Kids and pets are another contributing factor. Rust proofing protects metals by displacing moisture and treating the surfaces with highly effective corrosion inhibitors. The corrosion inhibitors form an adsorbed (bonded) layer on the metal surfaces. This microscopic layer acts like a series of tiny umbrellas, shielding the surfaces from water molecules. Just as a car battery will not work without its electrolyte. Metal corrosion will not occur if moisture does not contact the metal. 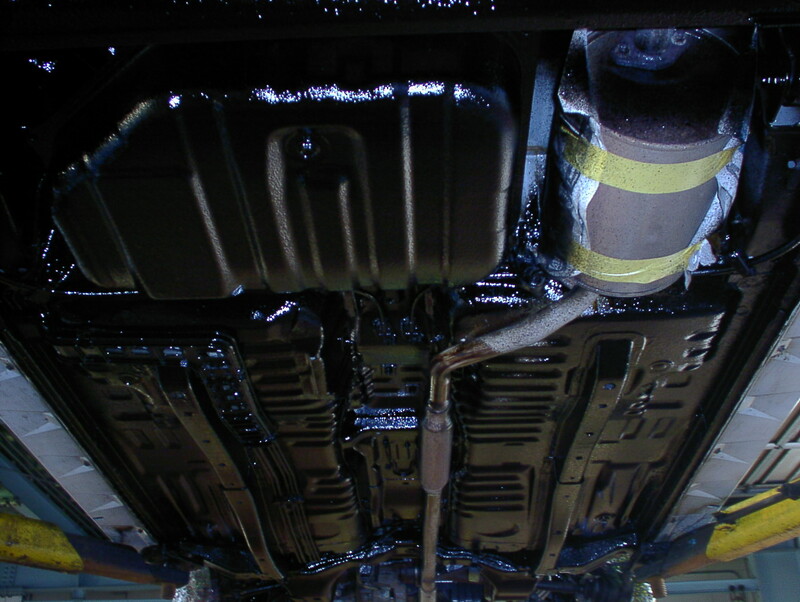 Undercoating the underside of your vehicle is the area most exposed to the elements of the road. Where gravel, road salts and other contaminates accumulate. Although seldom seen, is the most exposed gravel, sand, road salts and other contaminates accumulate in nooks, crannies and on the metal surfaces. These abrasions expose bare metal where the salt and moisture starts to rust. This undercoating protection is a rubber and petroleum based product that seals the under carriage. This makes it less susceptible. 2- Reduces road noise by 60%. 3- Keeps your vehicle warm in the winter, and cool in the summer. 4 Keeps moisture and road salt out, and protects against airborne pollutants that attach to car body metals. 5- Provides toughness and adhesion. 6- Provides elasticity and a galvanizing action in case of damage or rock bruising.